Originally from Ukraine, Elena began her dance training at her home country, performing with the kids’ folk dance group. 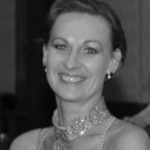 She always had an interest in Ballroom dancing but only when she immigrated to Canada in 2002 she got the opportunity to immerse herself in a beautiful world of partner dancing at the University of Alberta Dance Club. She enjoyed learning and worked consistently on improving her dance skills and became Teaching Assistant for the Club in 2008. The same year she decided to bring her dancing to the next level and started training and practicing for competitions. She competed for several years across Canada, representing the city and province. With her partner they have achieved their highest results in 2011-2014 with the gold medals at Northern Lights Classics, Rocky Mountains Grand Prix, Alberta Winter Classic. In 2015 Elena wrapped up her successful competitive career and took on new challenge in dance coaching. As a professional dance instructor she loves helping wedding couples to tell their love story through the dance. She encourages her students follow their dream and freely express themselves on the dance floor. Elena believes that dance is a powerful art that brings out the best emotions and enlightens peoples’ life.